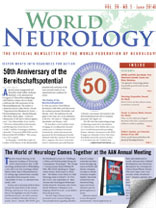 “I attended the Global Health Challenges: Neurology in Developing Countries. It was eye-opening to learn about the global burden of disease and specifically the difficulties in treating epilepsy in developing countries. “The clinical sessions, especially those on the new agents for multiple sclerosis, are very good. MS treatment has been closed, very routine and patients are getting tired of the same injections.